Bundle your ST subscription with NYT at only $19.90! Gain global perspectives from quality reporting when you subscribe to our exclusive bundle package with The New York Times. 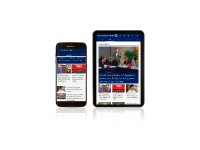 Enjoy unlimited digital access to award-winning journalism and multimedia content from both publications today. Enjoy unlimited access to ST articles on two concurrent devices at $14.90/month. Bundle your ST subscription with the NYT All Access package for 12 months at a special price of $19.90/month. *Prevailing rate of $14.90/month applies thereafter. These Standard Subscription Terms and Conditions ("Standard Terms") govern your subscription(s) to newspapers published by Singapore Press Holdings Limited ("SPH"), irrespective of the delivery platform or means of access. SPH has the right to amend these Standard Terms from time to time by posting any amendments on its website, and you agree to be bound by these amendments. All subscription packages and prices reflected on this website are applicable to home subscriptions only. You must be 18 years old and above to subscribe to our services. If you are below 18 years old, please get your parent or guardian to undertake the subscription. You also agree to be bound by any specific terms governing payment, subscription fees, minimum subscription periods, entitlements to any gift or premium under any promotion, termination fees and delivery fees which are applicable to your subscription as set out in our application forms for the relevant subscription packages and payment terms you have selected. SPH has the right to vary subscription fees payable or any other term relating to your subscription from time to time upon giving you at least 14 days' prior notice. Please take note that if you have opted to take delivery of the print edition of your subscribed newspapers, the applicable Delivery Fee, once charged, is non-refundable. Delivery Fees are charged by residential type, and will be charged by per subscriber account per delivery address. You should receive a letter acknowledging your subscription within 30 days of confirming your subscription. All subscription fees are due in advance. Please ensure that payment is made and cleared by your bank before each monthly/annual recurring payment is due. For payments by credit card, your credit card account must be in good standing and remain valid for the monthly/annual charge(s) to be debited successfully. If your credit card has expired, or if you wish to use a different credit card, you must notify us promptly by contacting our Customer Service – Circulation department at least 14 days before your next subscription fee payment is due. If you fail to provide us such notice in a timely manner, you shall be liable for any prevailing administrative, termination or other fees which SPH may impose in accordance with clause 10 below. Your subscription will continue and be renewed automatically on a monthly basis after the first month/year until you expressly instruct us that you wish to terminate your subscription by providing us with at least 30 days’ prior notice in writing at Customer Service, Circulation Singapore Press Holdings Limited. 1000 Toa Payoh North Annexe Level 6, News Centre Singapore 318994. If the minimum subscription period applicable to your subscription has not yet expired as at the date of such termination, the prevailing administrative, termination or other fees shall also be due and payable by you. Unless otherwise stated by SPH, any renewal of your subscription will be on the then prevailing subscription terms therefor. If timely payment of your subscription fees or other payments due from you is not made for any reason, or if you breach any other terms and conditions that are applicable to your subscription, SPH may, without prejudice to its rights and remedies at law to recover any sums due from you, suspend or terminate your subscription without further notice or obligation to you and you may be subject to the prevailing administrative, termination or other fees. If you experience any issues pertaining to delivery of newspapers (including but not limited to non-delivery of print edition of newspapers), please alert us promptly by contacting our Customer Service no later than two (2) days after the date of the newspaper(s) in question. In the event of any discrepancies or inaccuracies in your invoice/statement/records relating to the payment for your subscription, you must notify us promptly by contacting our Customer Service – Circulation department no later than fourteen (14) days from the date of the invoice/statement/records for us to investigate into the matter, otherwise our records shall be conclusive of the amounts due from you and we will not entertain any disputes in relation to the same. You confirm that the information provided in your subscription application form is true and correct at the point of application, and undertake to promptly inform SPH if there are any changes to the information provided from time to time. You may seek a temporary suspension of delivery of print newspaper(s) ("Temporary Stop") by making a Temporary Stop request online at our website at www.sphsubscription.com.sg (click on "Temporary Stop" option under "My Services" section). You agree that any Temporary Stop request (a) is offered on a goodwill basis only and is subject to SPH’s approval in its absolute discretion, (b) must be made at least three (3) clear working days (excluding Saturdays, Sundays and public holidays) before its intended start date, and (c) must be for a minimum of 3 consecutive days and cannot exceed 30 consecutive days per request. If you are a Print-only subscriber and your Temporary Stop request is approved for duration of at least 8 days, SPH may in its absolute discretion offer a refund or credit of your subscription for the duration of the Temporary Stop, up to a maximum of 30 days per calendar year in aggregate. All-in-One subscribers are not entitled to any refund or credit of subscription for any Temporary Stop of any duration as they will continue to have access to digital editions of their subscribed publications. You agree and acknowledge that notwithstanding any approval by SPH of a Temporary Stop request, SPH does not undertake or guarantee that all delivery personnel will carry out Temporary Stop requests without error or at all. In such event, notwithstanding Clause 14, you remain liable to pay for all newspapers delivered to you during any Temporary Stop period requested. SPH shall not be liable for any loss or damage which you may suffer in connection with any continued delivery of newspaper(s) or any Temporary Stop request. You agree to the SPH Member Terms and Conditions which can be found at http://sph.com.sg/legal/member_conditions.html and which may be amended from time to time. You agree that SPH’s decision on all matters or disputes relating to or in connection with your subscription and any matters ancillary thereto (including without limitation payment, delivery, promotions or eligibility requirements) are final and conclusive on you. In the event of conflict between these Standard Terms and the SPH Member Terms and Conditions, these Standard Terms shall prevail. SPH may, by notice in writing posted on its website, assign all of its rights and interests relating to or in connection with your subscription to a wholly-owned subsidiary of SPH (the “Transferee”) without your consent. Without prejudice and in addition to the right under clause 19 above, SPH may, by notice in writing posted on its website (the “Notification”), transfer and/or novate all of its rights, interests, obligations and liabilities relating to or in connection with your subscription to the Transferee, and you shall not withhold your consent thereto. For the avoidance of doubt, you hereby consent to (a) the assignment of all rights of SPH relating to or in connection with your subscription to the Transferee, (b) the assumption by the Transferee of all liabilities of SPH relating to or in connection with your subscription, (c) the release of all obligations of SPH relating to or in connection with your subscription, and (d) the Transferee taking the place of SPH as if it were named in all documents relating to or in connection with your subscription as a party thereto in place of SPH, in each case with effect from such effective date as may be informed in the Notification. SPH has the right to vary or amend any terms and conditions which may apply to your subscription upon notice in writing by posting to SPH’s website. For more details on subscription matters, please refer to http://www.sphsubscription.com.sg. 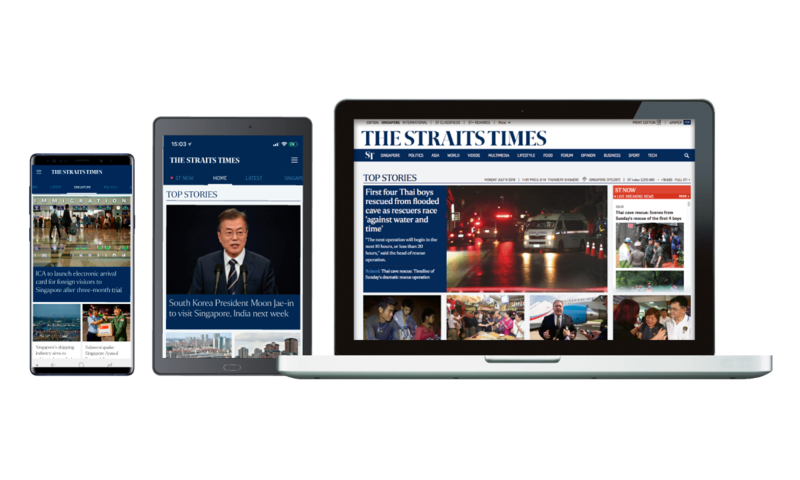 Participation in this subscription promotion where you are subscribing for The Straits Times and The New York Times bundle package (“Bundle”) is subject to the terms herein (the “Specific T&Cs”) and the Standard Terms and Conditions available above (the “General T&Cs”). In the event of any inconsistency between the General T&Cs and the Specific T&Cs, the Specific T&Cs shall prevail. This promotion is valid for The Straits Times (“ST”) Basic Digital home subscription package (the “Package”) in United States only, for a subscription period of twelve (12) months (the “Minimum Subscription Period”), subject to the terms and conditions set out herein. This promotion is not valid with other promotions and bundle deals. The promotional price for the Bundle is $19.90 per month for the first twelve (12) months, and $14.90 per month thereafter. 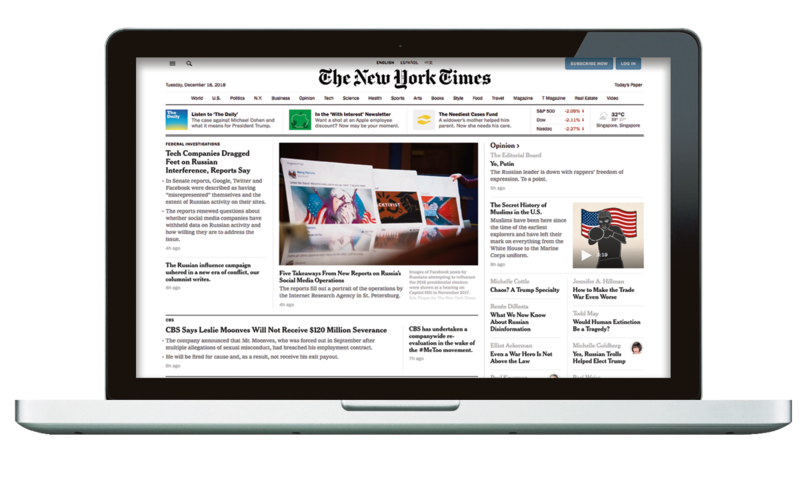 Subscribers will receive access to The New York Times for 12 months. An e-voucher code will be sent upon confirmation of order for subscribers to redeem their New York Times subscription. The Bundle promotion is only available for the first 100 subscribers. An e-voucher code will be sent to subscribers via email within 3 working days after the confirmation of subscription. Access to NYT must be redeemed by subscribers in accordance with the instructions and terms as stated on the Redemption email. E-Voucher codes for The New York Times which are not redeemed by you within 30 days of the Redemption email (or such other period stated in the email) will be forfeited. In such event, for the avoidance of doubt, your obligations under the terms herein (including without limitation to maintain the subscription for the Minimum Subscription Period) will continue to apply in full. 6.1.1 New subscribers: Subscribers who do not currently have a ST subscription (“New Subscribers”). A subscriber is a “New Subscriber” if their email address has not previously subscribed to ST directly with SPH or terminated within 90 days of the submission of the subscription application. Only one (1) Bundle may be redeemed or enjoyed per eligible subscription, per email address. 6.2.1 All existing ST subscribers. 6.2.2 Subscribers who had terminated their ST subscription in the past 90 days. To qualify for the above-stated promotion, you must (a) take up a New Subscription (as defined above) and (b) agree to maintain your subscription without any change of your subscription package for the entire duration of the minimum subscription period applicable to the relevant publication (“Minimum Subscription Period”). SPH has the right to determine your eligibility for the promotional price for the Package and/or the duration of the promotion period at its sole and absolute discretion and its decision thereon shall be final and binding. Upon expiry of the Minimum Subscription Period, you agree that your subscription for the Package will continue in force on the then prevailing terms for such Package until and unless you provide SPH with notice in writing that you wish to terminate in accordance with the said terms. b. termination fees of $300. Unless SPH has stated expressly otherwise, each subscriber may only enjoy one Bundle at any time, which may not be applied in conjunction with any other promotions or offers. Copyright © 2019 Singapore Press Holdings Ltd. Co. Regn. No. 198402868E. All Rights Reserved.